The Green Macaw (Ara militaris Linnaeus, 1766), is a bird belonging to the order of the Psittaciformes, family Psittacidae, genus Ara. Although it is, along with the Ara macao, the species of the genus Ara most frequent in captivity, seen that its populations in the wild are in constant decrement, the CITES has strongly limited its traffic for commercial purposes, allowing only the exchanges between Zoological Gardens, Zoo-Safaris, Zoo-Parks, Aquatic Parks, in the programme of plans of repopulation and Taxon Advisory Group (TAG), whilst the IUCN has inserted it in the sector of the species under risk of extinction. In the past, a scientific synonym of the Ara militaris was Psittacus militaris, name nowadays almost completely obsolete. The species divides in three subspecies all existant. All have a monochromatic prevalence of the military green, defined by some as saurian green, plumage with Dyck texture; what can change is the brightness of the colour, the size of the bird or some other morphologic character. 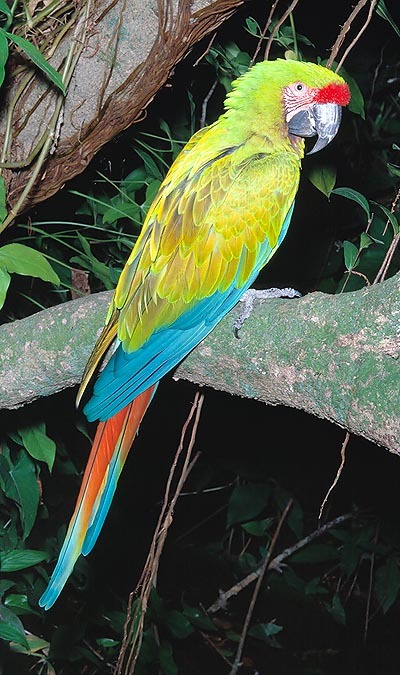 The Ara militaris boliviana, discovered by the French biologist Georges-Louis Leclerc, count of Buffon, in the remote 1741, during some of his expeditions in South America, is a subspecies of the good species Ara militaris; it is called Ara boliviana Militaer in Italian, Bolvian military Macaw in English, e Kleiner Bolivianischer Soldatenara in German. As it can be understood from the name, it is autochthonous to Bolivia, and in fact it is found in the south-eastern part of Bolivia, but also east of the Andes and north of Salta, Argentina, where it frequents the pluvial forests, without disdaining savannahs and prairies, till the coastal forests. 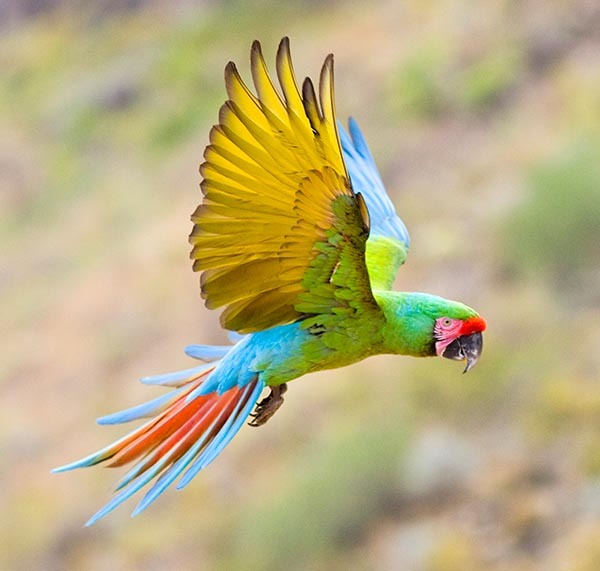 The Ara militaris mexicana (called also Buffon’s Macaw by some authors), is the second subspecies, discovered always by Georges-Louis Leclerc, count of Buffon, in 1750, called in Italian Ara militare messicana, in English Mexican military Macaw, and in German, Kleiner Mexikanischer Soldatenara. Still nowadays, it is found in central Mexico, south-east of the region of Sonora, south-west of Chihuahua up to Tehuantepec and south of Nuevo Leon as well as south of Tamaulipas. Finally, the last subspecies, the Ara militaris militaris, was discovered and described by the Anglo-Saxon biologist PJ Selby, who has left us some accurate drawings in his work “Illustration of Ornithology” of 1828. It is zoogeographically located in Peru, in the regions of Lambayeque and Cajamarca, from north-western Ecuador up to the Guajira in Colombia and in the Zuilia, in north-western Colombia. 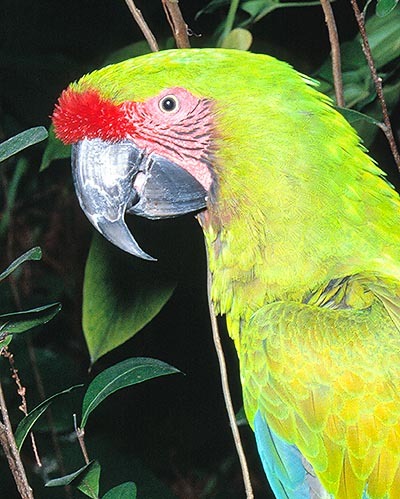 Substantially, the most singular characteristics are the presence of a brown throat in the subspecies Ara militaris boliviana, which is absent in the other two subspecies, and in the Ara militaris, whilst in Ara militaris militaris (or Buffon’s Macaw) the green and red feathers are somewhat darker and the beak is disproportionate in its dimensions. Usually, its dimensions are much similar, even if slightly minor, than those of the main species, but for the Ara militaris mexicana which exceeds the 70-80 cm of length typical of the main species. From data gotten on censuses done for all three subspecies and the main species, it has been remarked that the couples nidify usually on the lowlands at 500 m of altitude. But that, owing to the uncontrolled deforesting action done by the mining companies and agricultural bodies, the biologists have often identified couples nidifying at 2.500 m of altitude in Bolivia, and in Peru even at 3.200 m! It has a fragmented propagation, between Central America (Mexico, Ecuador, Costa Rica) and South America (Colombia, Venezuela, Argentina, Peru). It lives in the evergreen pluvial forests, but does not disdain to stay in the coastal and gallery forests, and can, even if characterized by a zygodactyl foot, be staying in biotopes such as the savannahs, the humid zones and prairies of Centre and South America. Its plumage is military-green along the body, red front (for the presence of a patch of red feathers), bare cheeks, white, bordered with small black feathers, black beak, yellow iris, blue belly. Also this is a species which can live long time, it can reach the 70 years and a length of 75-80 cm and a weight of about 1 kg. It is a frugivorous and granivorous parrot, which nourishes, in the wild, with nuts, almonds, dried seeds, and fruits, such as those of the plant Melia azedarach, called also bead tree, or paternoster tree, a deciduous tree, belonging to the family of the Meliaceae, which, even if autochthonous to India, southern China and Australia, since various decennia has spread also in South America. Finally, like other species of the genus Ara, they are very greedy of the figs of various species of Ficus, and of the seeds of the Hura crepitans, a tree belonging to the family of the Euphorbiaceae. In captivity, in order to simulate most closely the alimentary ecology, it is good to furnish it mixed seeds, such as hemp, wheat, millet, sunflowers, oats, etc. ; buds; fruits such as apples, pears, bananas; vegetables such as cucumbers, carrots; cereals such as maize and small quantities of nuts, peanuts, which they will utilize to stock mineral salts, useful for keeping the brightness of their plumage. They are very reserved and shy animals, which do not adapt well to very small spaces, in which they languish. In the wild, they live in noisy groups, each one of a ten of units. They are fairly good vocal imitators and have a good ability for effecting exercises. They are tameable, but they affectionate to their owner more slowly. Like the other species of the genus Ara, there is not a specific reproductive season. The female lays an average of 2-3 eggs, more rarely 4, which broods for about 26-27 days, while the male takes care of the nutrition of the partner as well as of the pullets. The weaning of the pullets happens around the twelfth week of post-natal life. The sexual maturity comes around the fifth year of life for the male, and the third-fourth for the female.